MASON, OH - November, 2005- Demands are increasing for extremely high-quality manufacturing processes and machinery to reduce cycle time and cost in the production of complex molds with superior finishes. With high-tolerance shape and surface requirements required in such areas as micromachining and medical applications, polishing and benchwork not only needs to be minimized but essentially eliminated. It is becoming more imperative that the required surface finishes be achieved during the actual cutting process. To accomplish this, depth direction needs to be enhanced to improve accuracy in the machining process of precision components. Makino engineers have completed months of testing on enhancements to mold surface finishes in order to determine the best solution available to eliminate the thermal displacement and abrasion that causes this effect. And they have come up with a new patent-pending process to ensure superior surface finishes without slowing down operations. In advanced technology machines with built-in automatic tool changers (ATCs), where surfaces are often milled by different tools, there is a detectable and measurable occurrence of difference in the spindle thermal displacement. Makino engineers say this is caused by the slight inaccuracy of tool change positionings and different spindle speeds, and by minor occurrences of tool abrasion. Although the extent of these surface differences is very small, they can cause problems when the polishing process is shortened or eliminated. Various efforts were tested by Makino engineers in machining procedures to minimize such slight differences. It was discovered in testing that one method to negate this impact requires the use of tools that do not easily act abrasive in the finishing process. This requires that one tool be used for the entire machined surface finishing process. However, most operations and processes do not allow for the potential of just one tool to finish the entire machined surface of the mold. The diameters of the tools used to machine such molds are becoming smaller, and varieties are needed at different rotation speeds to properly finish such molds. Makino engineers have developed a more practical solution to better enable position control. They have designed a patent-pending "Hybrid Automatic Tool-Length Measuring System" that is available on its precision Hyper 2J, V22 and V33 high performance vertical machining centers. The key is to measure the position of the tip of the rotating machining tool at the submicron level. Measuring the tip of the tool in a highly accurate and stable manner is vital, taking the expected thermal displacement caused by spindle rotation into consideration. Measuring by a contact sensor is an appropriate method to achieve high accuracy measurement, as cutting oil or chips do not easily affect it. There is also a method for measuring accurately by a non-contact sensor, as well as a combination of processes. The measurement system invented by Makino engineers, which is referred to as the Hybrid Measurement System, is actually the combination of the contact and non-contact measuring options. The tip of the machine tooling is brought in contact with the low contact, pressure-contact sensor while the spindle is stopped. The effect of vibration can thus be minimized and the position of the tool tip is measured highly accurately. 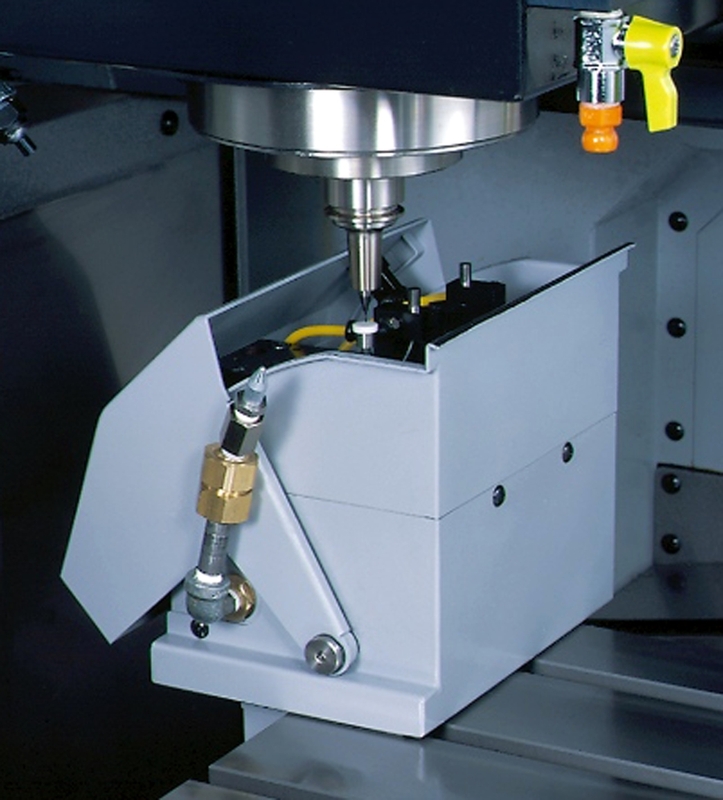 The spindle with the machine tooling in place is rotated at a speed used during the machining process, and a non-contact sensor measures the position of the spindle end. By measuring the end of the spindle, which has specified shape and accuracy as a machine component, it is possible to measure the position, accounting for thermal displacement caused by the spindle rotation in a highly accurate and in a stable manner. The control unit then determines these two measurements, and the calculation result is regarded as the position of the tool tip. The obtained position of the tool tip is then used as tool data during the machining process. The following case study describes how the Hybrid System measures the tool tip position, and the measurement results are used as tool data during the machining process. On a Makino V33, six different types of tools were used, with various spindle speeds and axis feed rates for the roughing and semi-finishing. Five different types of tools were also used for the finish machining process. Before each process began, the Hybrid System measured the position of each tool tip, and the measurement result was used as tool data during the machining process. The level differences between the machined surfaces finished by five different tools and the reference plane were all within one micron, as measured by the roughness meter. In a similar test with the Makino V22 vertical machining center, four different types of tools were used for roughing and semi-finishing processes, and six different types of tools were used for the finish machining process. The NAK80 40 HRC workpiece was 60 x 45 x 25 mm, and was machined in 2 hours and 39 minutes using a rotating R2.0 ball end mill at a speed of 20,000 min-1. A portion was machined by using a rotating R1.0 ball end mill at a speed of 40,000 min-1. The level difference between the two surface portions that have been machined by two types of tools at speeds of 20,000 min-1 and 40,000 min-1 were both within one micron. In another V22 test seven different types of tools were used for the finish machining process of a television mold. Also using a Hyper 2J fine precision vertical machining machine the Hybrid System, two different types of tools were used for the roughing and semi-finishing. The latter was machined by a R1.0 ball end mill at a speed of 20,000 min-1, 30,000 min-1 and 40,000 min-1. The level difference among those portions machined at different speeds is within one micron. These results clearly indicate the high precision process and capability of the Hybrid Automatic Tool-Length Measuring System machining. Level differences were quantitatively evaluated, and were determined to be extremely small despite the different tools and speeds employed. This Hybrid System testing indicates that extremely high-quality machined surfaces can be obtained. Makino engineers note that with these superior and more accurate surface finishes, polishing and bench time can be eliminated, substantially reducing lead time. No one will do more to lower machining costs than Makino, a global provider of advanced machining technology and application support for the metalcutting and die/mold industries. Makino manufacturing and service centers are located in the United States, Japan, Germany, Singapore, Italy, France, Korea, Taiwan, Turkey, China, Mexico, Brazil, and India, and are supported by a worldwide distributor network. For more information call 1.800.552.3288, or visit Makino on the Web at www.makino.com.